If you’re a stay-at-home mom who’s been mulling over the idea of returning to the workforce, you’re not alone. A Pew Survey found that 61 percent of mothers with young children want to work at least part-time. But if you’ve been out of the workforce for a year or more, the transition back can be, well, eye-opening. For those moms considering a return to work, here are five tips. 1) Start with a self-assessment. Who are you doing this for? Self-fulfillment, financial contribution to the family, or another reason? What is your goal for working? The added income, a sense of accomplishment, interaction with other grown-ups, a love of your career? When do you want to go back – is there a do-or-die time frame or are you flexible? Where do you want to work? The same industry as before? Something new? At home? Out of the house? How do you want to work? Part-time or full-time? Set schedule or flexible schedule? Freelance or employee? Once you answer these questions, you’ll have a much better sense of who you are, what you want, and how to get it. 2) Think about your job options. If you had a career before your family, do you want to return to that line of work or try something new? What other careers are you interested in? What skills do you have? Do you need to learn new ones? What types of flexibility are most important to you? Do you want to be self-employed, or work for someone else? Most working mothers want jobs at least flexible enough to accommodate family emergencies, school activities, and other mom-related responsibilities. The career you once had might not provide the flexibility you want now, so having plans A, B, C, and D can help you to find a job that works for you. 3) Start your job search. There’s no time like the present, and it’s easy to get stuck in self-assessment mode, so don’t forget to start your job search. Check out niche websites catering to working mothers, flexible jobs, or your specific career ideas to see what jobs are available. Especially if you want to work from home, become aware of common job scams and how to spot them. And don’t forget to job search through networking, volunteering, and other in-person activities. Joining a professional association is one of the best ways to whip yourself back into work mode quickly, and you can meet lots of people who can help with your return to the working world. 4) Create a support network of fellow WAHMs. You’re not the first mom who’s transitioned back to work after being a SAHM, so call on your friends and family who have been in this situation before to get their advice and support. And virtually, The Work At Home Woman’s Facebook Page is an inspirational place to meet women from all over who are doing the very same thing as you. 5) Use your time as a mom to your advantage. Then, connect your skills as a mother to the skills required in the job description or to the skills you used at previous jobs. Be sure to translate your experiences, so they make sense to a potential employer. Don’t assume they’ll make the connection on their own – make it for them, and with confidence. 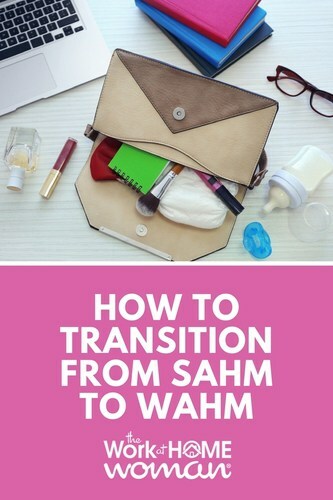 The keys to making the transition from SAHM to WAHM are to know what you want, research so, you know where you’re going, have several backup plans, enlist the help and support of others, and actually get started. That last key is the toughest part – taking action. The sooner you take the plunge, however, the closer you’ll be to your goal. Sara Sutton Fell is a mother of two and the CEO and Founder of FlexJobs, the leading career website for telecommuting, flexible, freelance, and part-time job listings. A passionate advocate for work-life balance and working mothers, Sara was named a 2011 Game Changer by Workforce Magazine. She lives and works in Boulder, Colorado with her husband and two sons. Joining a professional organization is a great tip. It makes you feel like you’re part of the work force right away. Also check your previous job to see if they have transitioned to paying people to work from home. You’ve already got the skill set and you might get lucky as so many businesses are now starting to hire wahms.